Here are the latest images of The Shard, a mixed-use tower at London Bridge in London, designed by Renzo Piano Building Workshop. Construction work has started on the 306 metre-high building, which will sit on an irregular-shaped site adjacent to London Bridge station as part of a new development called London Bridge Quarter. The design consists of several glass facets that incline inwards but do not meet at the top, and is inspired by the masts of ships that once anchored on the Thames. The 72-storey building contains offices, apartments, a hotel and spa, retail and restaurants and is topped by a 15-storey public viewing gallery (below). The Shard will replace the 1970's Southwark Tower building on Bridge Street which has since been demolished in preparation for construction, which is due to be completed in 2012. Images are by AVR London. Increasing density in central London, particularly near major public transport nodes, is key to London’s future development. Improving the efficiency of the public transport system and maximising the use of space around transport hub is essential. Given the Shard’s location above one of London’s key commuter stations, bus interchange and two main underground lines, a high density development was deemed not only possible but very desirable. At an inspiring height of 306 metres (1,016 feet) and with a total 72 occupied floors reaching skyward into a breathtaking 15 story spire, the Shard London Bridge Quarter is set to be the tallest building in Western Europe. The Shard immediately adjacent to London Bridge Station will rest elegantly on the London skyline, providing a welcome new symbol for the world financial capital. The Shard replaces the Southwark Tower, a 1970’s building located on London Bridge Street. The Shard offers high density vertical development at a transport hub and will be the UK’s first truly mixed use tower, devised to interface with London on many levels. The master architect, Renzo Piano, designed the Shard as a ‘vertical city’ that includes a public piazza, 586,509 sq ft (54, 488 sq m) of world class office space, an exclusive collection of residential apartments which will be the highest residential apartments in the UK and will be serviced by Europe’s first 5-star Shangri-La Hotel, retail space, restaurants, and a public viewing gallery. This will all ensure that it becomes the beating heart of a regenerated London Bridge Quarter. Inspired by the spires of London’s churches and the top sails of the ships that used to moor on the Thames, the Shard will be a light and elegant presence in London’s skyline. The plan is generated by the irregular nature of the site. Each facet forms a shard, a plane of glass gently inclined inwards, rising towards the top. The corners are open and the shards do not touch, allowing the building to breathe. In turn the glass surface fragments as it rises and the tower dissolves into the sky. The Shard offers 54, 488 sq m (586,509 sq ft) of flexible prime office space and is set to become the premier commercial address in London. Over 45% of the Shard has already been pre-let to Shangri La (floors 34-52) and to Transport for London (floors 4-10). The remaining available office space offers all the amenities one would expect from a desirable central London address. The highly flexible floor plates are efficient and effective with space nett internal floor area ranging from 2,790 sq m (30,032 sq ft) to 1,349 sq m (14,521 sq ft). A key feature of the office floors is the naturally ventilated winter gardens. These spaces were first devised by Renzo Piano for his acclaimed Aurora Place skyscraper in Sydney, Australia. These multifunctional areas make the most of the stunning views across the Thames and from Hyde Park in the West to Canary Wharf in the East from the Shard. The winter gardens can be used for a variety of purposes and allow occupants to enjoy natural light and air within the office. The offices within the Shard are accessed via a dedicated entrance on the concourse level of London Bridge Quarter. The office entrance also benefits from direct access to London Bridge mainline station, the bus station and the Jubilee and Northern lines on the Underground. The first Shangri-La Hotel in the UK will occupy floors 34-52 of the Shard and will contain 195 rooms and suites. The hotel will operate on the simple yet powerful philosophy of a warm, efficient and seamless service that has made the Shangri-La Hotels and Resorts Group famous. The Hotel will also feature a signature Shangri-La Spa on floor 52, which is available to guests as well as the residents and workers in the Shard and London Bridge Place. The Hotel also has its own entrance on St Thomas Street with valet parking and taxi drop off point directly outside. An exclusive collection of apartments at the Shard are arranged on floors 53-65 and are the highest elevation residences in the UK. With their amazing vistas across the London skyline they will be one of the most coveted addresses in the world. The apartments will be the ultimate in sophisticated and contemporary living, with each being custom designed to the resident’s exact specifications. The apartments will also benefit from all the services and facilities of the Shangri-La Hotel. To ensure the maximum levels of privacy synonymous with an exclusive address, residents at the Shard will have their own private entrance on St Thomas Street. Uniquely, the Shard will be open to the general public who can visit the viewing platforms on floors 68-72. These viewing galleries offer breathtaking 360° views across London. The viewing galleries are accessed directly from an entrance on the mezzanine level at below ground level so that visitors do not cross over with any of the other users of the building. The galleries are expected to attract over half a million visitors a year and with visibility at 800 ft (almost double the height of the pinnacle of The London Eye) are certain to become a major tourist attraction. The Shard will be a striking new addition to the London skyline, commanding panoramic views across the capital doubling the height offered from the London Eye. The Shard will become the tallest building in London as it reaches the maximum height allowed by the Civil Aviation Authority with unobstructed views thanks to its proximity to the river. The Shard will contain an exciting mix of world class restaurants and cafes for the enjoyment of residents and visitors alike. With its prime location on top of a major transport interchange, the Shard is expected to become a destination in its own right with people travelling from across London and the rest of the UK to dine in one of its restaurants (located on floors 31-33) and experience the highest view in the United Kingdom. The development of the Shard and the creation of London Bridge Quarter has provided the opportunity to transform the transport facilities at this major London transport interchange. London Bridge Station is one of London’s busiest railway stations, with an average of over 350, 000 journeys through the station each day. In addition to a new concourse for London Bridge Station, a bigger bus station will be constructed to the north of London Bridge Place with 15 bus routes, as well as riverboat and taxi stands. The train and tube stations will be extended covering an impressive 61 underground and 247 rail destinations. London Bridge Quarter will also include a significant new public square with ever changing art installations, cafes and places for visitors to the area to relax. By bringing the soul back into the heart of the city, London Bridge Quarter will benefit not only tenants and residents of the Shard but also the local community by becoming a vibrant public space for everyone to enjoy. 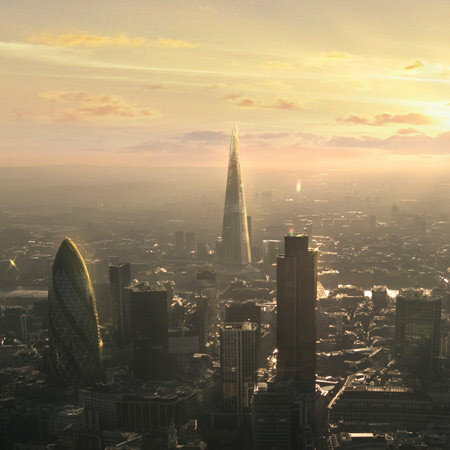 When completed in Spring 2012, the Shard London Bridge Quarter will be an awe inspiring part of the London skyline. With its hotel, restaurants, luxury residences, flexible premium office space and public viewing galleries the Shard is a welcome addition to this long overlooked area of Central London. The Shard will form the nucleus of London Bridge Quarter, a large scale regeneration program for the area by Sellar on behalf of LBQ Ltd. This far-reaching program will improve the local district and reinforce the importance of this gateway destination for the benefit of all of London.